It's been nearly nine years since the FZ16 first came out and it's grown into a massive success since. Our thoughts back then were that the excellent chassis could easily handle more power and so began the wait - Yamaha would eventually bring a more powerful engine in, right? Well, it took a wee bit longer than we originally thought but here we are, say hello to the FZ25! Let's start by acknowledging that this bike isn't going to win any spec sheet battles. Yes, there are more powerful bikes and more advanced bikes out there for less money. 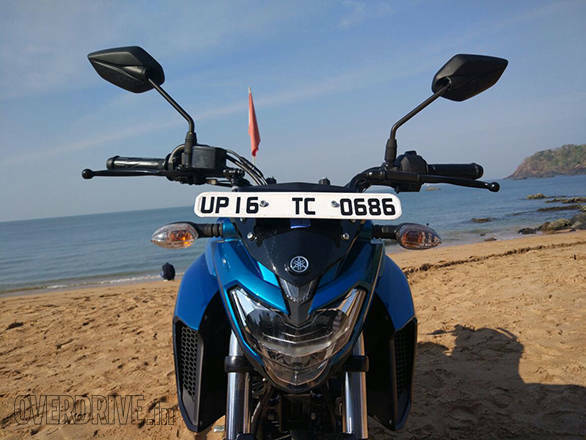 But Yamaha is taking a different route; the company intends to provide its valuable FZ16 customers something to upgrade to when they begin to crave more power. 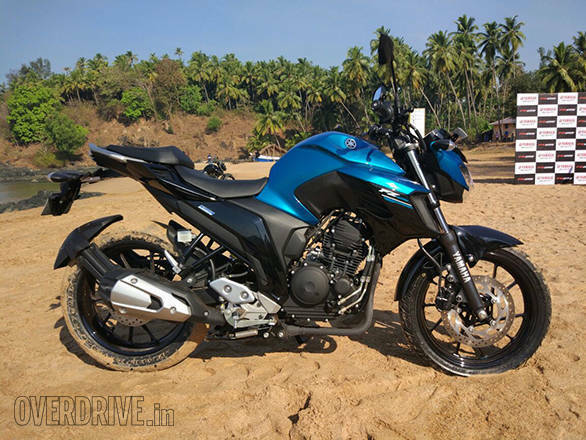 After having ridden the bike for a couple of hours, one thing emerges clear as day - the FZ25 offers the same approachable, premium flavour that customers of the smaller bike so love. 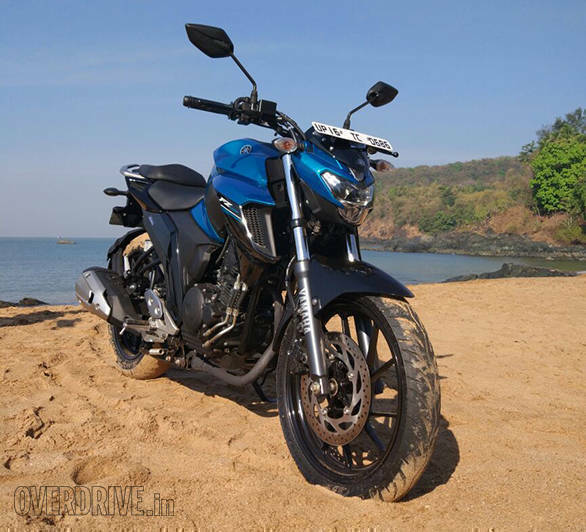 Viewed head-on, the FZ25 is quite a unique looker with its MT-inspired, low and mean-looking headlamp. The headlamp unit itself comprises a halogen position light and three LEDs - two 13W units for the low beam and one 9W diode for high beam. High beam sees all three on for a combined wattage of 35W. 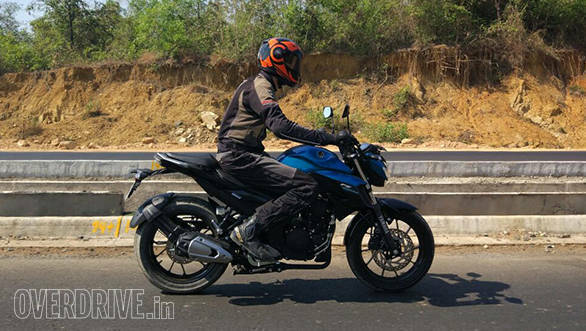 We'll need to ride it extensively in the dark, but initial impressions at the night time launch event indicate this headlamp isn't as eye-piercingly strong as the 10-LED unit in the Bajaj Dominar 400. Another point of interest is in the large tank extensions that feature real air vents, a nice touch. The tank is large and chunky with big grooves that house two Yamaha logos on either side. Splitting the two painted tank panels is a matte black section that is already showing some scuffs on our test bikes. A tank protection pad will do well here and Yamaha offers these as an accessory. The side profile looks more familiar with a split-seat design and split grab rails at the rear that are easy to hold onto. The LED tail lamp is also quite reminiscent of the TVS Apache RTR, familiar, but it gels well on the FZ. Finally, there's a neatly integrated saree guard and a smart-looking plastic splatter guard that bolts onto both sides of the swing arm. 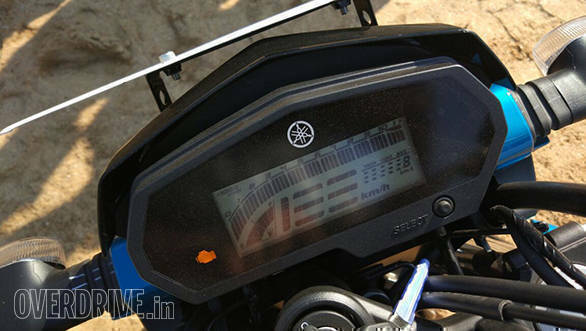 Information is relayed to the rider via a fully digital LCD screen that offers two trips and fuel-efficiency data in addition to the standard speedo, rev counter, clock and idiot lights. I did miss having a gear position indicator and a side stand down warning or cut-off, both useful features in a bike that intends to be a premium city-focused bike. Switchgear is simple but quality leaves no complaints. You get a kill switch on the right and traditional indicator buttons on the left. The pass light switch is integrated into the high/low beam switch on the left and the headlamp is an always-on affair. Build quality seems up to par, but Yamaha revealed that the plastic panels are now thinner but with adequate strength, all in the name of keeping weight down. Yamahas have a great reputation for build quality, and it will be interesting to see how these lighter, new panels fare in our tough conditions. 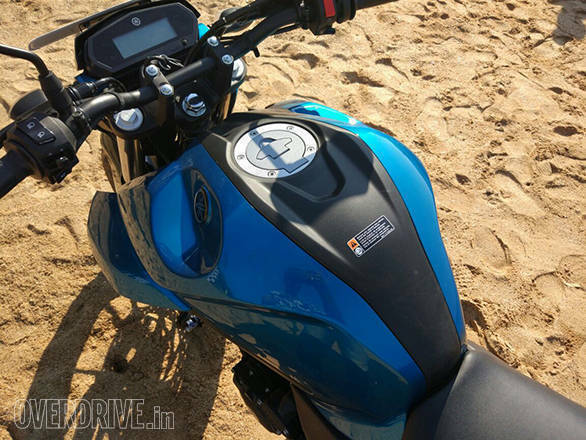 The 249cc mill in the Yamaha FZ25 is a relaxed performer. The two-valve engine is air-cooled but benefits from an oil cooler. Fuel injection is standard while the Blue Core tag brings in a forged aluminium piston, nickel phosphorus-plated cylinder wall and thin, low-friction piston rings, all in the name of reducing frictional losses and boosting combustion efficiency. This engine has been in the Yamaha portfolio for years and has proved itself in off-road applications like the XT250. Yamaha reckons that while it may not boast the power or tech of its rivals, this is a proven package and will remain reliable. This is of great importance for Yamaha in our challenging environment, especially considering that some customers are not prompt or particular regarding regular service. Power stands at 20.9PS at 8,000rpm and peak torque of 20Nm arrives at a fairly low 6,000rpm. These figures aren't sensational for a 250 but they represent a serious jump-up from the 13.1PS/12.8Nm FZ16. As the rpm figures indicate, a strong, tractable bottom and mid-range take precedence over flat-out performance. 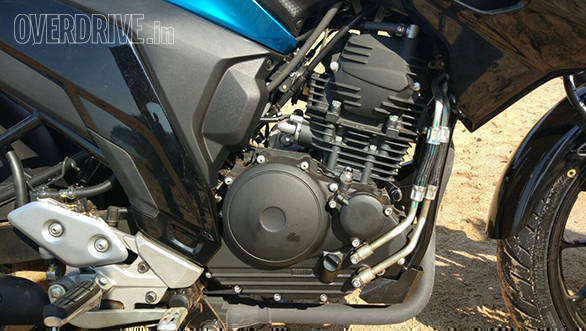 The engine settles into a smooth idle with a similar but slightly deeper note than the FZ16. Clutch action is light and the 5-speed gearbox engages with decent precision. Like the FZ16, power comes in a very smooth and linear manner with no sudden steps in the power band. Low rev performance is strong but the engine doesn't complain too much if you rev it out to the 10,000-odd rpm redline either. But there's no real point in doing so. Performance has seen a significant boost. 110kmph comes up with the ease that it took the old bike to hit 90kmph, and this speed is sustainable on the highway. 120kmph and above produces a buzz in the bar and pegs that will eventually cause fatigue. The top speed I saw was 134kmph on a slight uphill section, so getting 140kmph on the display should be possible. Overall, city performance is punchy, a 100-110kmph highway cruise is easy but you do miss a sixth gear at high speeds. Yamaha claims an overall efficiency of over 40kmpl (we're still awaiting the exact figure) which along with a 14-litre fuel tank should provide a good range. The FZ25 isn't just an old bike with a new motor. The motorcycle gets a new double-down tube frame, and most of the development work was done in Japan. Kerb weight is a very manageable 148kg, and the bike feels light and easy on its feet. The riding position is familiar, with the feet folded up slightly and a mild forward lean to the bar - comfortable yet keeps the rider sufficiently connected to the bike. Tall riders will find enough space and the seat height of 795mm should be accessible for the vertically challenged. Similarly, 160mm of ground clearance should ensure no speed breaker scraping issues. Suspension comprises a pair of conventional 41mm forks up front and a monoshock at the back. The FZ25 ships with 100/80 and 140/70 section, 17-inch MRF Zappers. These bias-ply tyres offer good grip for the application. Yamaha says they've dropped the previous radials from the FZ16 following durability complaints on our roads. The new tyres will also be cheaper to replace; exact prices will be out soon. Ride quality is similar - taut, yet not uncomfortable, and it strikes a good balance between everyday comfort and enthusiastic riding in the hills. The FZ25 offers a composed, confident feel on winding roads and is quick to change direction. Only when you start to push really hard will the suspension start to feel soft, a gentle reminder that this is not what the FZ25 is about. It's a similar story with the front and rear disc brakes. Initial lever feel isn't very sharp, but the rider is provided sufficiently strong performance when the lever is pulled in further. This offers friendly, real-world usability but isn't ideal for aggressive riding. ABS, sadly, is not an option and is unlikely to be one until mandated by the government. The FZ25 is a deeply thought-out step forward for Yamaha. 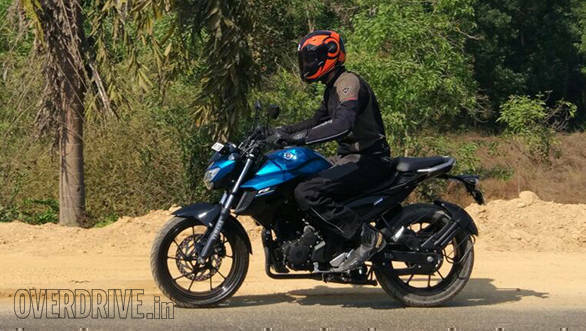 Over the years, the company has discovered that the FZ16 is a big seller, regularly moving 15,000-odd units a month which is significantly higher than its rivals. However, customers had no choice but to move on to other brands when they inevitably grew bored with the performance on offer. With the FZ25, you can tell that care was taken not to alter the feel and flavour of the smaller FZ that appeals so highly to buyers. To sum up then, the FZ25 is an FZ16 with the power it always deserved. This is not the bike for those of you looking for sharp, involving performance. Bikes like the TVS Apache RTR 200 4V, Bajaj NS 200 and particularly the KTM 200 Duke will more satisfyingly scratch that itch. 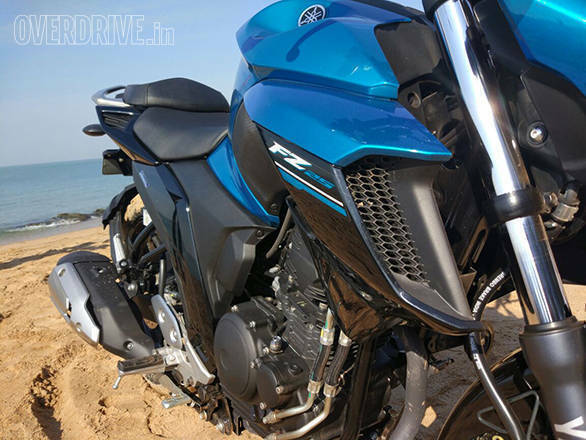 But for those looking for a premium, stress-free and quick motorcycling experience, the FZ25 is your best bet yet. At Rs 1.34 lakh on-road Delhi, it is roughly Rs 15,000-20,000 more expensive than the TVS and Bajaj. That sounds expensive but look at it this way, if so many customers were willing to spend Rs 92,000 for an FZ16 when they could have got similar performance for less money, won't they make the reach for the FZ25? My hunch says they will.